This time, they did go through a sound check. This time they did rehearse for the show. They got back on their old feet again, and gave us a truly great concert. The audience got soooo excited. What amazing oldsters! (I'm sixty myself.) And the last night's show turned out to be a very special one for my daughter and me. Our seats being in the first row, we brought a photo of my late wife with us. And to our surprise, they played Angie. In 1973, I met my wife because of this song. It must have been a coincidence, but I had put up a request for the song weeks ago. Also they came near and waved to Block A-11 more often than to other areas. Well, I'd better stop letting my wild imagination run away with me. Every one of the audience was given something special of their own, and I'm going to keep mine for the rest of my sweet short life. 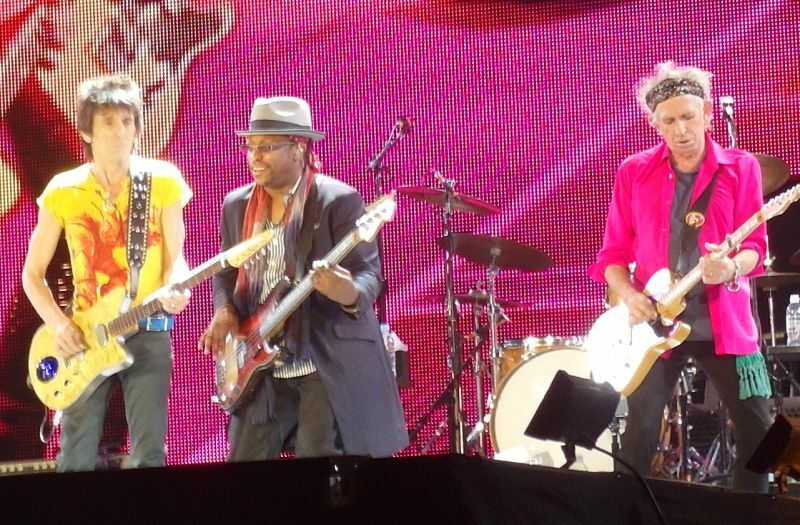 A Stones gig put any decently brainwashed fan into Stones mood days before the show. Arriving at the dome hours before the show, watching the 2 hour line for merchandising. The excitement is there already, in the street, all around the Arena. Comes the waiting in the arena, here Tokyo Dome with a super-hot crowd. The inevitable meeting with Stones friends from around the world (this time a little chat with BV himself about the latest rumors and the previous show) is always hearth warming. The small exciting stories like this friend of a friend who was just invited for a two minutes face to face with Keith one hour before the show started and is now tweeting his picture to the entire country. Then the show itself. I will not say again how amazing it is that show after show, this band keeps surprising us. They are just too great to be true and the Japanese public made it clear to them... . They played beautifully, so relaxed, so much in control. Midnight Rambler was a highlight (but for me it always is... .). And they did enough mistakes to remind us that, no, they are not from another weird place, they are from planet earth!!! Rolling Stones spirit. The bond is everywhere, it's beautiful, it's fantastic!!! We were freezing so much we went into the nearby Starbucks for some warming up after the shopping experience and some walking around, coffee and a nice cake. 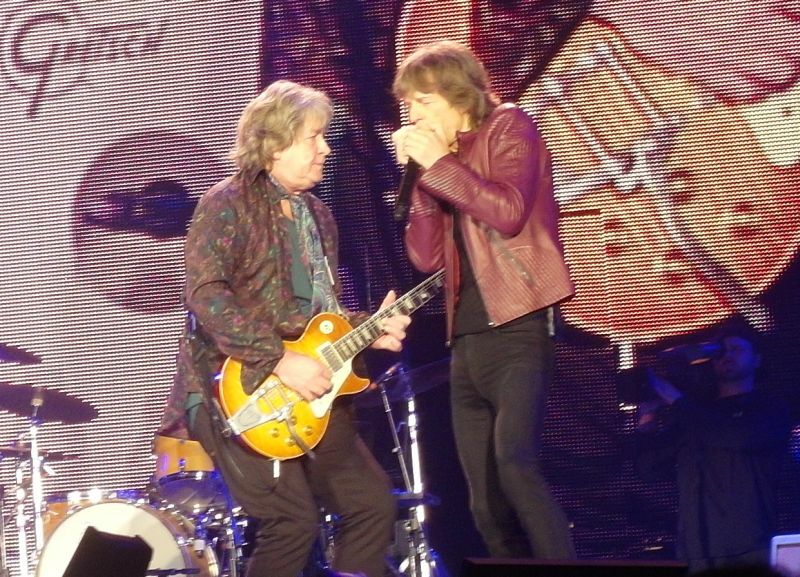 As we came out from our warmup coffee we faced the Tokyo Dome, it was still more than four hours before the Stones would be on stage, but we were hearing loud and clear ... "Silver Train" ... 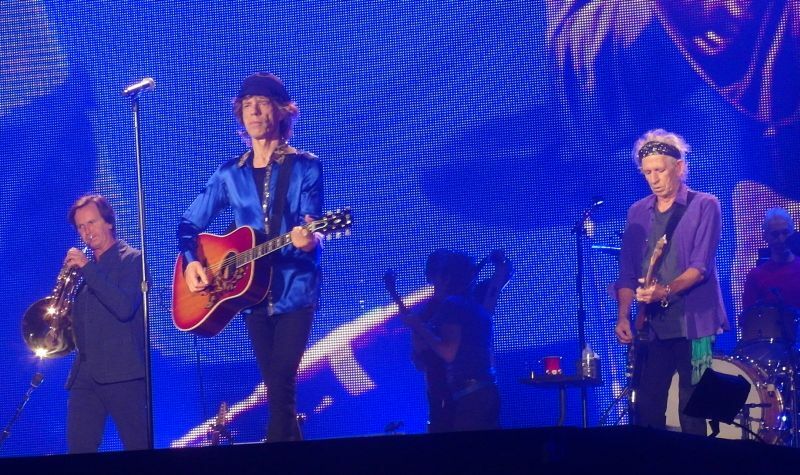 So great to hear Mick's voice, the guitars, the song, the harmonica, and we knew this might be a song we would hear later tonight. Then they did a second complete take of "Silver Train", and we know for sure they were seriously planning it into the set list. This was rehearsals not just soundcheck. Then "Angie", they make a grown man cry. As we get older I hear more and more fans and friends say how much they love Angie. Daughters have been born and named Angie... Then they did the intro of "You Can't Always Get What You Want" with the choir, and finally "Happy". We were happy, and went for a beer and some sushi at our now favorite 5th floor japanese restaurant nearby the dome. Once inside the Dome, it is great to meet up with old friends you have meet in other parts of the world. We may live in different places on the map, in different cultures and with different options for travel, work, family and time off. But when a tour is announced we sit down with the map and our scheedule in front of us and we wonder how the next months will work for us, how we can rearrange work and family matters, how we can fit the Rolling Stones into our normal life. And somehow we manage, in a way. And finally, on show day, our eyes shine and our hearts are beating a bit faster than normal when we are inside and meet up with old friends, including the Stones. The Rolling Stones are on a minute or two before 7pm. "Start Me Up" is a kick-start sort of heartstarter if you are not sure about the crowd. If "Start Me Up" did not kick-start the crowd, I am sure the next one made everyone know there were there and alive, highly alive. The roof of the dome was lifted a bit when they did "You Got Me Rocking". Probably one of the most popular songs tonight, lots of energy in the crowd to pick up on that song, a "must play" and so basic Stones. Drums rolling. Crowd screaming, guitars cutting through the air, Mick all over waking us up? Somebody sitting now? No. Nobody. Toky is on. 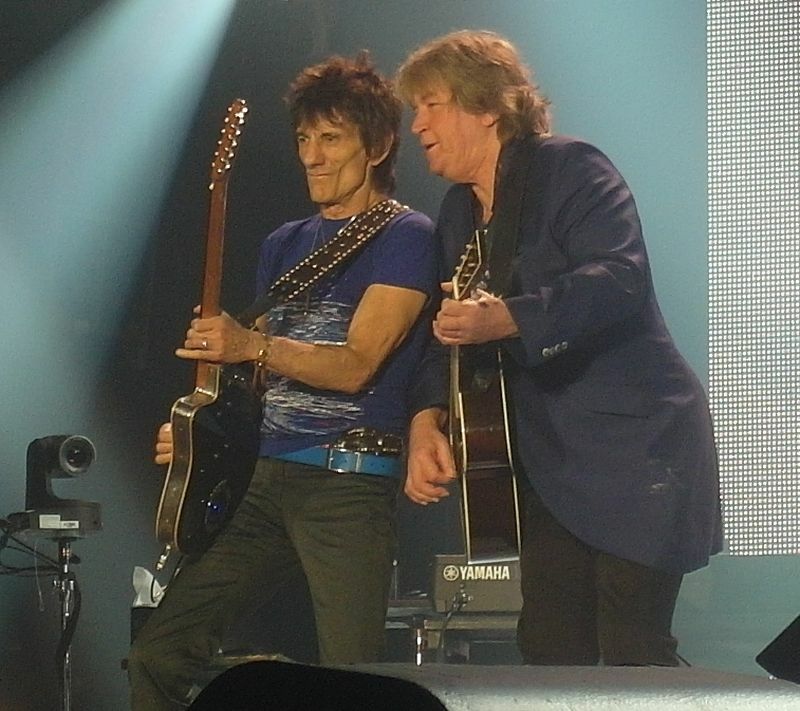 "Silver Train" with Mick Taylor. I spent my days and weeks before the tour in Paris listening to the making of this new version, and it was a bit different to hear it for real inside the stadium. Goats Head Soup was my third new releases Stones album so I have special feelings for that album. How much I wish they could do a show with every song from this album, I know I have to settle with this one and Angie tonight. May be Heartbreaker later. The crowd was in listening mode, they listen but they do not freak out like on "You Got Me Rocking". Well they listen on "Angie" too. Listening does not mean it is not great, please please play it again and again! Lisa was very emotional when Mick presented her as the Oscar winning Lisa Fischer through the movie 20 Feet From Stardom. So good to see Lisa happy and honored. 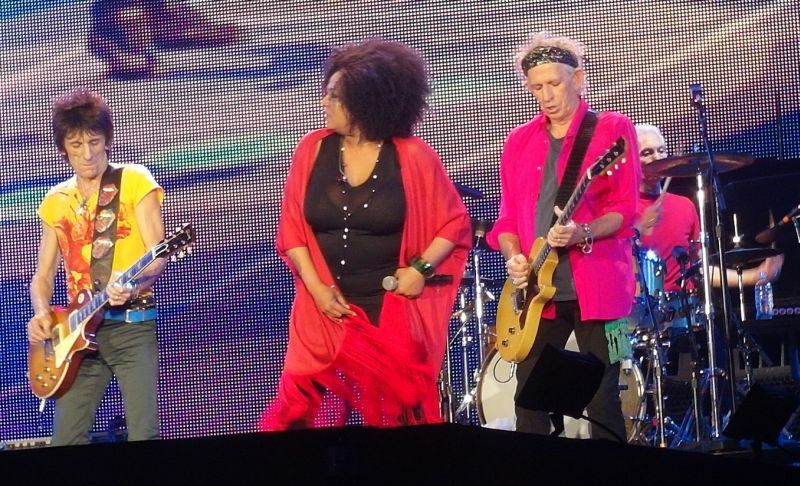 And later on, may be because of this, another highlight of the show was when Lisa walked all the way down to the center stage to do her solo part on "Gimme Shelter". Oh my oh my she can sing. She did not save any parts of her voice. She was singing and the crowd was singing and the spotlights were on her and the moment could last forever. No more guests on "Gimme Shelter" please. We want Lisa. Then Mick came and sure the show must move on. Crowd pleasing moments you keep in your mind for a long, long time. 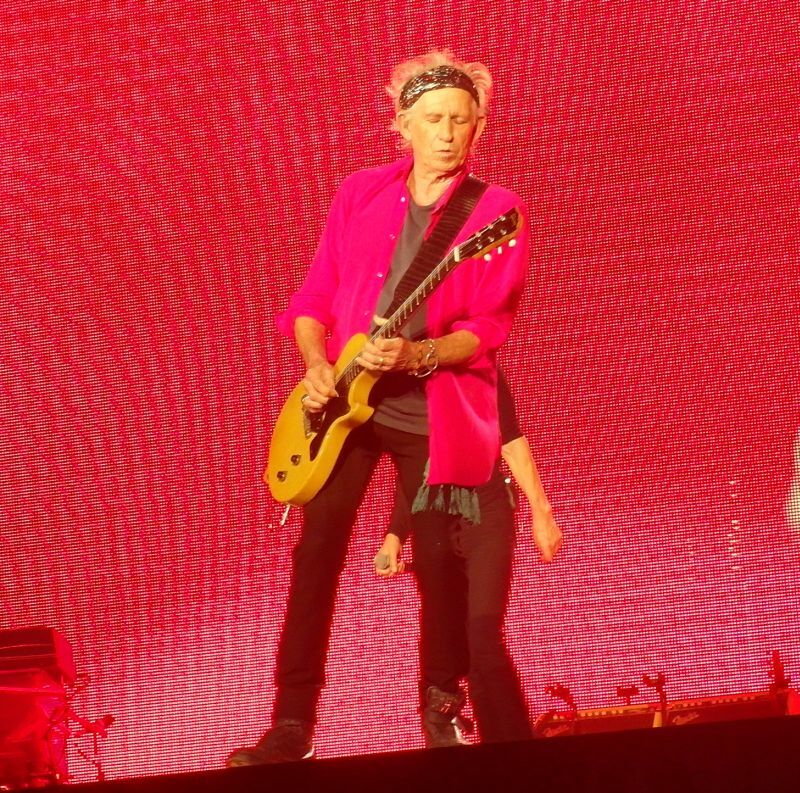 "Sympathy For The Devil" is giving us a Keith Richards on fire. 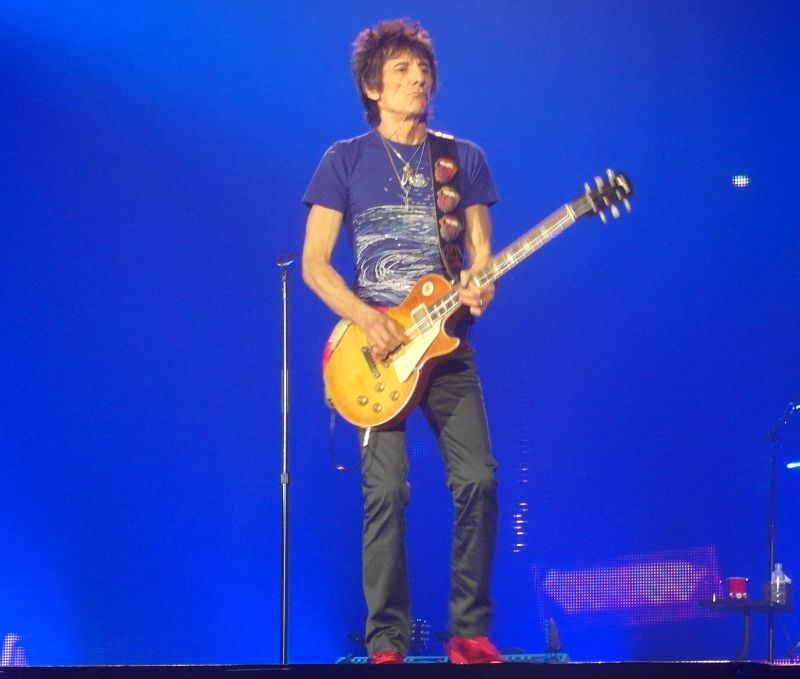 He did not walk down with Mick and Ronnie for the small stage on "Miss You", probably because he saved his moment for himself on "Sympathy". Running down, greetings by the entire dome in a roar that is like a jumbo taking off, we all know how popular Keith is in Japan. Very popular. The missing link. Like my Japanese friends say. First Mick Jagger came to Japan. Solo. Then they had to wait. Then the entire Stones came. With Keith. 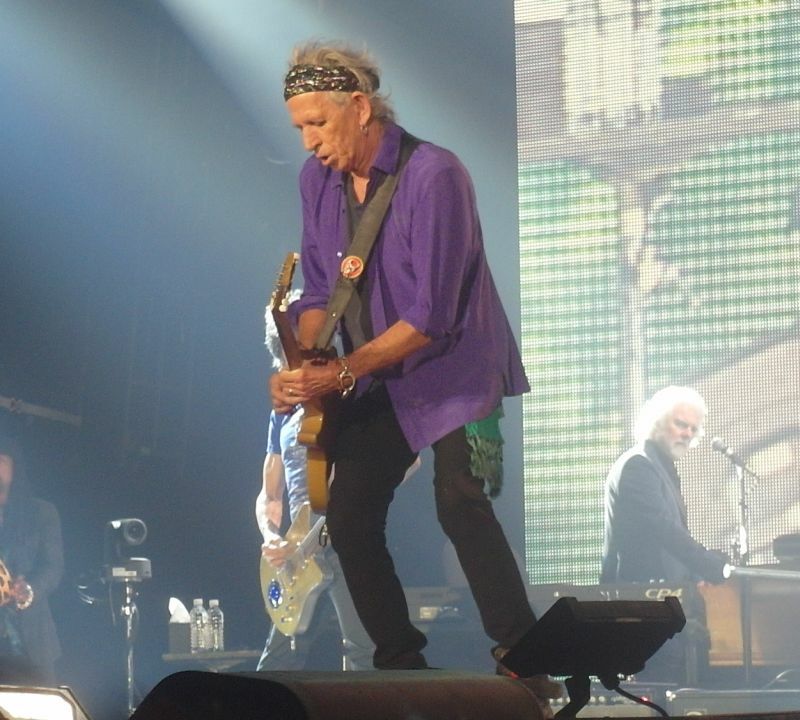 They loved Mick but Keith made the Japanese Stones experience complete. So many Keith signs up in the air, also so many Mick signs of course. They say this show was much better than the first show, because Keith was better in his performance. Well how would I know? For me a show is good when the crowd is good, and when my ears and heart and body is moved by the music and the crowd. I don't care about a riff or two is on or off tune or in or out of timing at times. 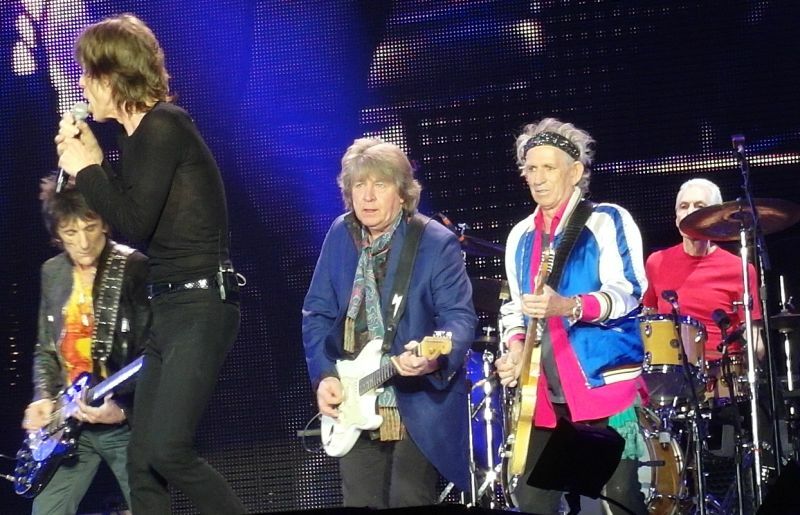 I have lived with the Stones for most parts of my life by now, and this show number two was great, not as great as Tokyo-1 but still a great memory for many reasons. I think the crowd was better at Tokyo-1 and Keith was better at Tokyo-2. Marginally, not dramatic different. But you never tell your best friend he or she is a better friend today and may be not as good today as last time you met. You live with your friends and the good relations and you take all the great moments and relations you have built over the years in fact a lifetime. The final image from the show... Keith and Charlie walking close together. They are the last two to leave the stage tonight. No hurry. Happy pals. Happy fans. I will have this image with me until the next time I see them. How do they know? I've visited the world largest fish market this morning and I came across different gaming shops downtown where you see guys in suits playing like kids all sort of games. Who am I to find this ridiculous or condemn hard working people for their moment of joy or distress? The weather was lovely today and around 4 o'clock I was drinking whiskey with a Stones friend on the balcony of our hotel room. Around 6.15 we walked up to the Dome and arrived their half hour later. Once we found our spot - first row near the little stage - and sat down, the lights went out and the concert started! The sound in the Dome was mind blowing, crystal clear, powerful and very loud! You Got Me Rocking followed by It's Only Rock 'n Roll were rocking and this was definitely the best proof that the Rolling Stones are still the greatest around. A funky Tumbling Dice followed and I really liked Angie, just as my youngest daughter. Mick nearly missed some lines during Doom and Gloom as it all went very fast. Silver Train was next - I must admit I voted for this song from 6 different devices/ip addresses earlier this week... but what a choice. I'm sure that the Stones rehearsed this song the same day several times as it was just perfect with a strong Mick Taylor on the left side. 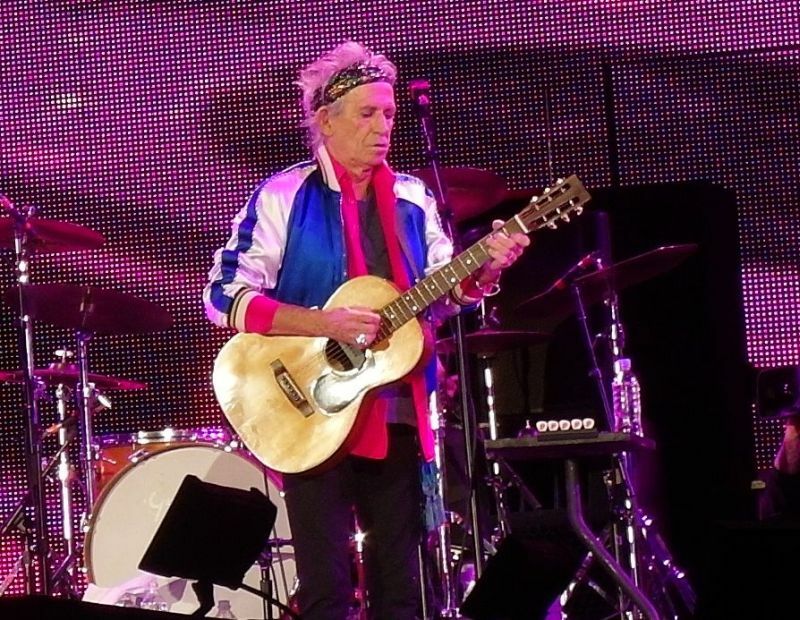 He stayed in the background and played as well on Slipping Away with Keith singing his heart out. 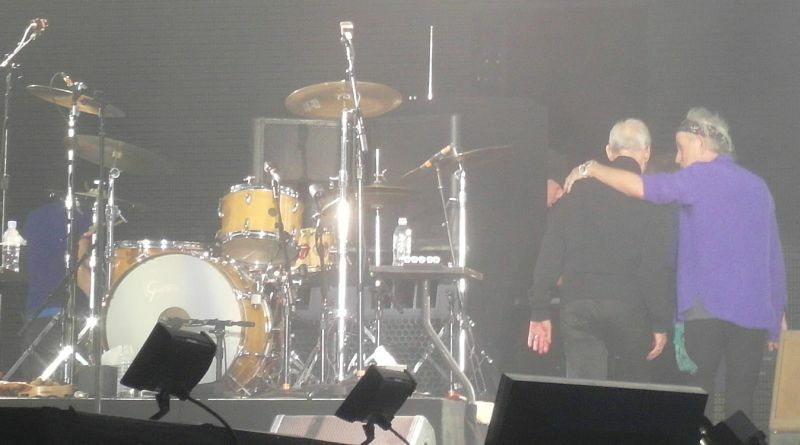 During a very HAPPY Keith Mick Taylor stayed behind Charlie's drumkit before returning for Midnight Rambler. 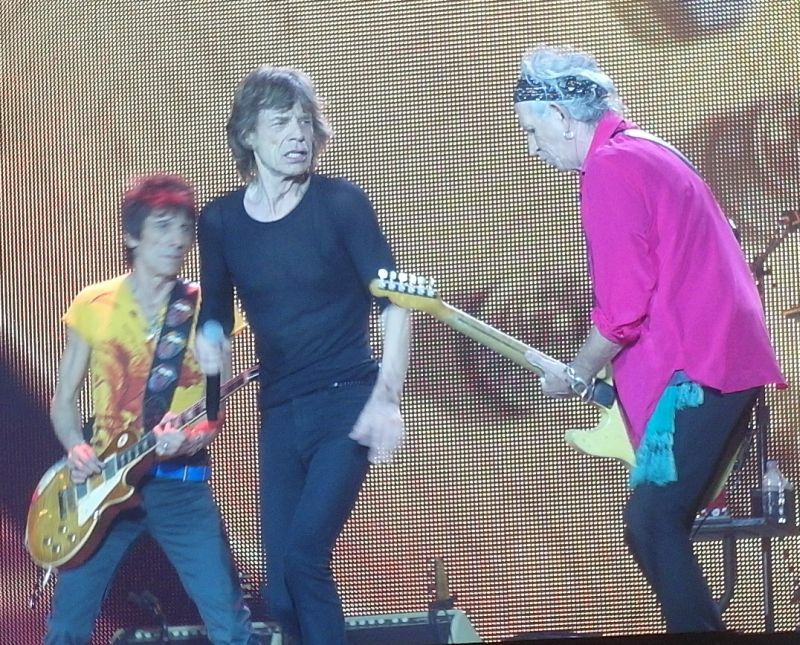 This song set the arena on fire and Keith thanked Mick afterwards with an hug. Before I even realized Miss You and Painted it Black were played when Lisa Fisher came right to the small stage singing along with Mick on Gimme Shelter. Wawwwwwwwwwwwwwwww, what a sound! I enjoyed the last couple of songs and I must say that I found it annoying that security came along several rows to point out smartphone owners that they were not allowed during the show - even not after it - to take pictures. Time flies and before I knew the second Dome show was history, thankfully there's a third one on Thursday in this great venue and nice theme park! Honestly speaking I am not so impressed with today's Stone's show compared with Paul MCcartney's show last November in the same Tokyo Dome. I never cried through today's Stone's concert although I had been full of tears through the Paul's show. It is not fair to compare the two concerts. Because Paul's show was about 20years interval and today's Stones show was only 8years interval for me. "You got me rocking" was great as usual. "Silver train" was the first concert experience for most people in this country. "Midnight rambler" with Mick Taylor has never been that grooved among my past many "Midnight Rambler" 's experiences. "Gimme shelter" was Lisa's great work with Grimmer Twins. Mick's acoustic guitar in "You can't always what you want" was very fresh. But something is missing. Finally I understood that was why I didn't drink beer before the show. That is the biggest reason of my "no satisfaction". The second reason is that my seat was located in the most deep area in arena seats. It was sometimes difficult for me to see the stage because the man in front of me was very tall man. There might be another reason. I want to be satisfied with next chance. Nobody knows when it will be.